The Montgomery Expressway is a 12.5 mile two lane/four lane roadway. It connects the residential areas of Coosada, Millbrook, and Prattville (and nearby parts of Elmore and Autauga Counties) to the central business and governmental districts of downtown Montgomery. Opened in 1998, the Alabama River Parkway provides an alternate route to the congestion and construction delays of Interstate 65. The Alabama Freedom Pass is a debit card which resembles a standard credit card but has the added feature of being a Radio Frequency Identification (RFID) card. Its simple touch-and-go operation enables ultra quick and convenient use of the toll facility. As an Alabama Freedom Pass holder you also gain free additional usage and you receive special benefits. AUTOMATIC DISCOUNTS - 10¢ (or more) discount per trip for prepaid users. TIME SAVING CONVENIENCE - No looking for coins or waiting for change. Just touch your card and go. NO PERIODIC FEES TO PAY - There are no monthly or annual fees for maintaining your account. AUTOMATIC RENEWAL - Become a Prestige Customer and automatically replenish your account with a VISA or MasterCard at the amount of your choosing. 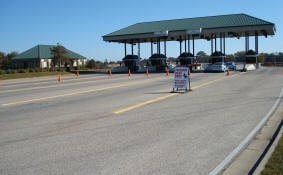 ADDITIONAL ALABAMA FREEDOM PASSES - Your cards work like a joint checking account, so your entire family or fleet can have access to the bridge. DETAILED PRINTOUT OF YOUR ACCOUNT - Perfect for end of year tax recording.